How to disable font smoothing in Xcode 9? But this no longer works with Xcode 9. Would it be possible to disable font smoothing in Xcode 9? I probed deep for a noninvasive way to accomplish this, and failed. 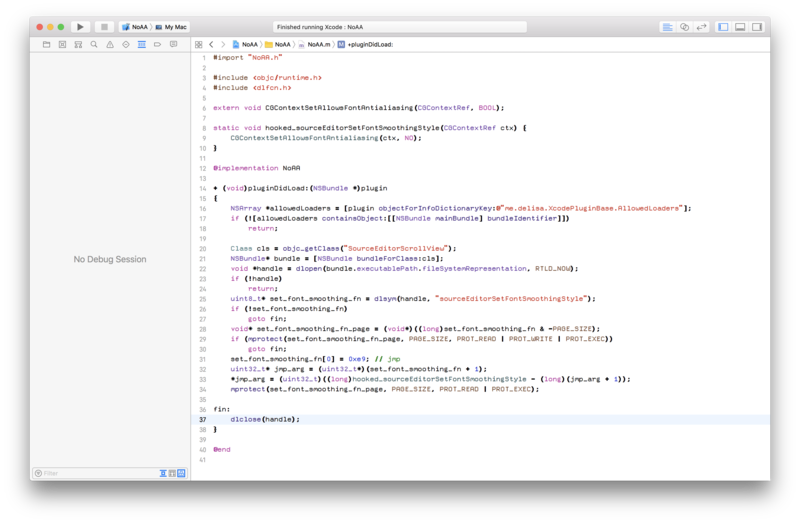 As far as I can tell, the text rendering path in Xcode 9 very deliberately turns on font smoothing. I wrote an Xcode plugin. You might have heard that Xcode 9 uses code signing restrictions to forbid the loading of plugins. This is true, but a few mavericks press on, and tonight we ride with them. I launched Xcode, clicked through the dialog warning me about the new plugin, and then used the newly-added Window > Package Manager to install the "Xcode Plugin" template. I made a project with this template. I visited my new project's Info.plist and added that UUID to the DVTPlugInCompatibilityUUIDs array. Visit the target's Build Phases. Add a new "Link Binary With Libraries" phase. Hit the plus. Navigate to the directory above (you can just press the / key and then paste the path in) and choose SourceEditor.framework. It should appear in the list. The project should still build. …I think the gotos add character. Basically, it just defines a function that takes a CGContextRef and turns off text antialiasing for it. Then, it overwrites the beginning of a function inside the SourceEditor framework which ordinarily configures antialiasing settings — don't need that anymore — to jump to our function instead. It does all of this in an incredibly unsafe way, so if something goes wrong, Xcode may politely crash. Build and run the project, which automatically installs the plugin. Accept the addition of your plugin, and that's that. If anything here doesn't work because I messed up, let me know. I'm not planning to roll this into an Alcatraz plugin myself, but you or anyone else should free to do so with credit (after filing a feature request with Apple). Email codedump link for How to disable font smoothing in Xcode 9?